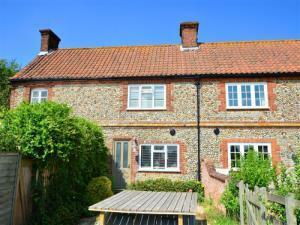 3 Field House Cottages01263 715779work01603 870304fax Self-cateringClose to the wonderful North Norfolk Coast, this charming flint and brick cottage is cosy and welcoming and has a lovely rear garden with views over the fields. Situated in the village of Hindringham, you are never too far from one of the many pubs, shops and restaurants. This cottage is perfect for a relaxing holiday in beautiful countryside. • Other: Bed linen provided. Books, Games, Radio, Travel Cot, Highchair and Stairgate provided. Telephone for incoming calls only. Outside of brick and flint cottage. Close to the wonderful North Norfolk Coast, this charming flint and brick cottage is cosy and welcoming and has a lovely rear garden with views over the fields. Situated in the village of Hindringham, you are never too far from one of the many pubs, shops and restaurants. This cottage is perfect for a relaxing holiday in beautiful countryside.